hire live wedding bands in Warwickshire today with Adam Chandler. Warwickshire. Grandiose elegance, classic architecture, and contemporary ambition – the perfect setting to Adam Chandler's range of wedding music. Adam Chandler – a wedding serenade across Warwickshire. Something old – Adam Chandler's swing band. Something new – a disco light show from Adam Chandler wedding music. Something borrowed – the skill and focused attention of Adam Chandler's musicians. Something blue – the sound of Adam Chandler's flagship blues band as they rock your wedding. With over a decade of touring and performance experience, and the capability to captivate any size and style of wedding and venue, the only call you need to make when arranging the music and moves for your Warwickshire wedding is to Adam Chandler. 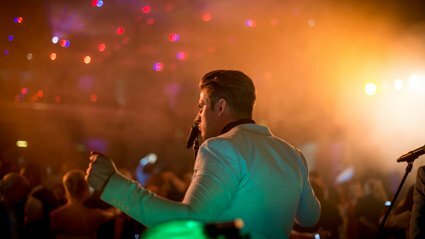 With a range of wedding bands to accommodate all styles of wedding, any size of venue, and give every age group on your guest list a reason to get up on the dance floor and strut their stuff, Adam Chandler brings friendly professionalism and personal focus to the wedding music industry. From riverside to railway nostalgia, ten people to a hundred, Adam Chandler's wedding bands can tailor their performance to suit your style, ambitions, and intentions, and ensure your wedding is as smooth as their sound. Memories are made of music, and great marriages are made of memories – so, get your life together off to the right start, with music from Adam Chandler and his range of wedding bands and skilled musicians. From first dance to last note, throughout the ceremony or just for the reception, Adam Chandler offers something for everyone. Give him a call, and discuss exactly what you'd like your wedding to sound like, now and in the memories of evermore, today. More Wedding Bands in Warwickshire! Wedding Bands available around Warwickshire and beyond!